You love grilled shrimp, you love grilled scallops and you love grilled veggies. 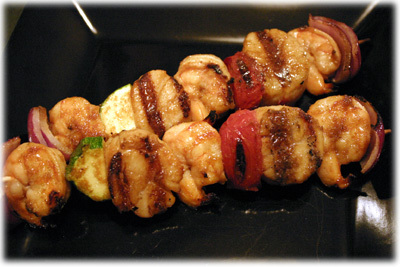 Why not just combine your love with these amazing shrimp and scallop kabobs! One of the nice things about seafood like scallops and shrimp, on their own they tend to lack much flavor but with a short soak in a marinade they quickly absorb whatever flavors you want. Each ingredient in the marinade below has its own powerful flavor but when combined they suprisingly work together perfectly for these kabobs. The scallops and shrimp really soak up the flavors so just leave them in the marinade 4 to 6 hours tops. Don't feel restricted by the veggie suggestions I give you, tomato, onion and zucchini. Feel free to use whatever you like with these. And one more tip, scallops do have a tendancy to stick to BBQ grates if you're not careful. It's actually a bit harder for them to stick with this recipe because the kabobs are liberally coated in the butter-based marinade when they go on but as an added precaution I recommend you oil the grates well before cooking. It's easy and guarantees success! 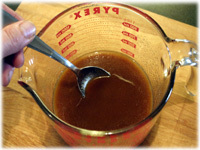 In a small glass bowl add the melted butter and stir in the soya sauce. Once they're well combined add the garlic powder, worchestershire sauce, tobasco and grated ginger. Stir well and set aside to cool the butter slightly, you don't want to be pouring hot marinade over the scallops and shrimp. 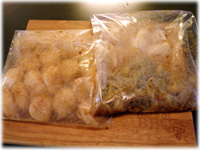 Place the scallops in a plastic resealable bag and the shrimp in another plastic resealable bag. Pour about 1/4 cup of marinade into each bag, gently work it around so everythings covered, seal and refrigerate 4 to 6 hours. 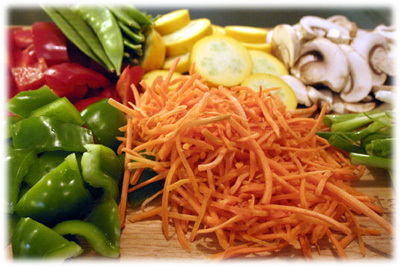 Reserve 1/2 cup of the marinade to use for basting while the kabobs cook. Soak 6 long 12" bamboo skewers in water while the seafood marinates. Preheat the grill to 500F and set up for direct cooking. Remove the scallops and shrimp from the refrigerator after 4 to 6 hours. You'll notice the butter has hardened and congealed around the scallops and shrimp. This is a very good thing as it helps baste the kabobs while they cook. Thread a piece of red onion on a skewer followed by a shrimp and a scallop. Add a tomato followed by another shrimp and scallop. Add a slice of zucchini sideways on the skewer through the rind followed by a shrimp and a final piece of onion. The picture above shows this combination but really, you can mix and match any way you like. When the grill has reached 500F oil the grates well. 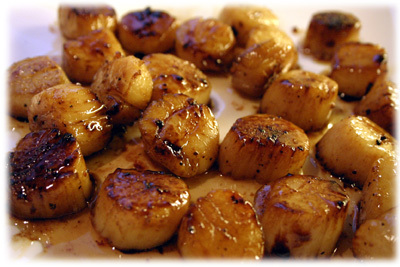 Scallops tend to stick to BBQ grates so it's important to keep the oiled before cooking. The marinade contains lots of butter which has congealed around the scallop so that also helps keep them from sticking to the grates. 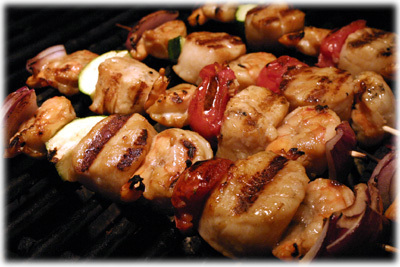 Place each shrimp and scallop kabob on the grill and close the lid. After a few minutes lift the lid and give each kabob a wiggle to loosen from the grill. Check the underside to see if the scallops and shrimp are getting nice grill marks, if so go ahead and flip them over carefully so nothing falls off. Baste each kabob with the reserved marinade and close the lid. After another couple minutes lift the lid and give each kabob a 1/4 turn and baste with the marinade. 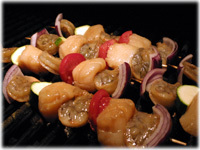 After about 6 to 8 minutes the shrimp and scallops will be cooked and can be removed from the grill. It only takes a couple minutes each side to cook the scallops and shrimp.